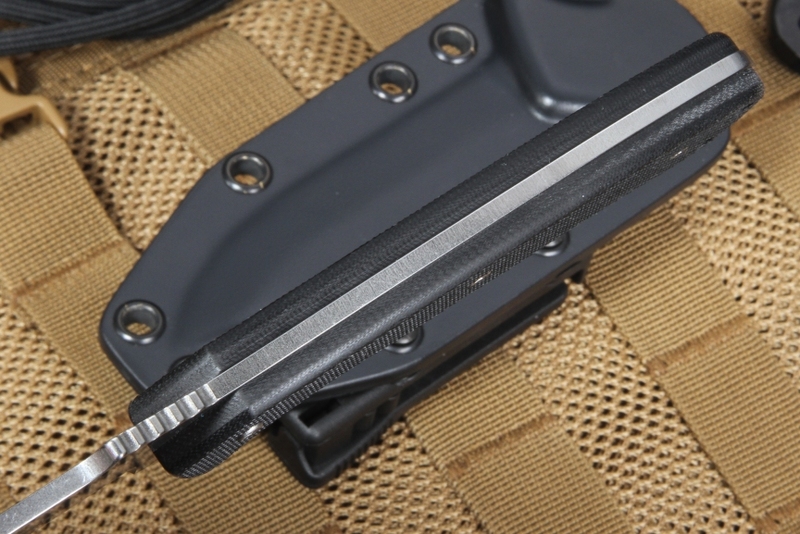 The Emerson Police Utility Knife, or "PUK," is designed specifically for heavy-duty use in tactical, police, or military situations. Built with the boys in blue in mind, the PUK is a beast of a fixed blade that never backs down. The stout 3.6-inch 154 CM stainless steel blade boasts an RC rating of 57-59, providing a razor sharp edge and exceptional edge retention. The sleek spear point blade shape, precisely honed V grind, stonewashed flats and satin finish all add to the aesthetic appeal, as well as the functionality, strength, and resistance to wear and corrosion of the 154CM steel. The PUK's solid full tang construction is sandwiched between two pieces of 4.9-inch durable textured black G-10, providing an uncompromising grip while the blade is in use. 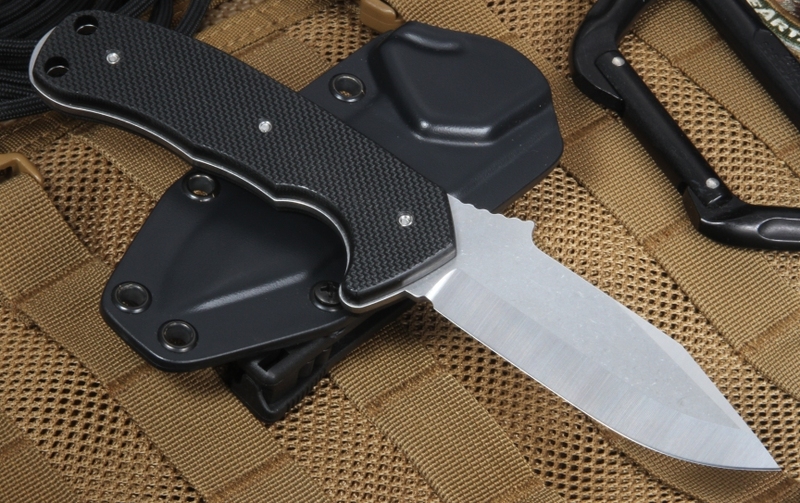 Also featuring a deep guard, positive thumb ramp, and ample jimping on blade's spine, the fixed blade will stay firmly in your hand and allow for an extremely tight hold and excellent blade control. Shipped with a black Kydex Blade-Tech Tek Lok belt clip and sheath, this Emerson fixed blade is ready for action right out of the box. Two lanyard holes in the handle offer extra carrying versatility. The Police Utility looks and works great alongside other tactical, police, or military gear. Strap it to a vest, bag, or clip it on your belt and be ready for anything at any time. Ernest Emerson's expertise with edged-weapons and martial arts, as well as his previous work with United States military special forces members is evident in the PUK. 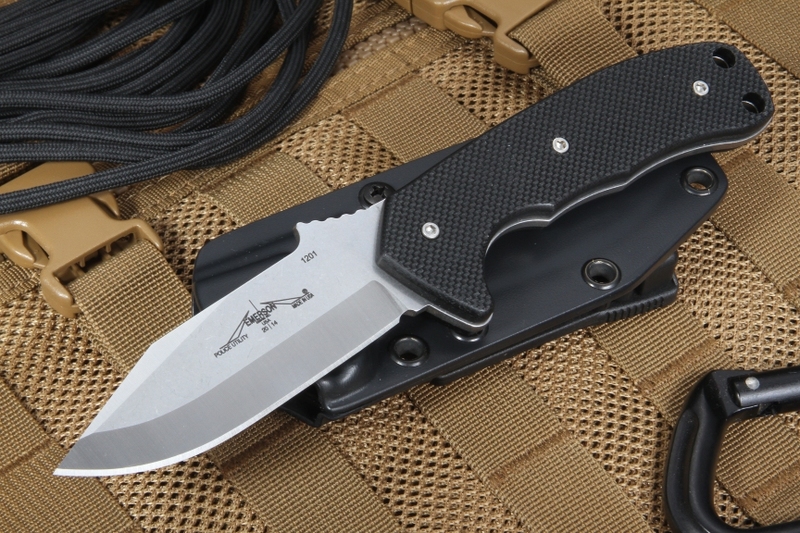 He knows exactly what makes a great fixed blade tactical knife, and it's all here. His work has also been featured and exhibited at the Metropolitan Museum of Art and the Smithsonian Museum, a testament to his dedication to craftsmanship and the art of knife making. All Emerson Knives are made in the United States with the finest quality materials and the most precise workmanship. As an authorized Emerson Knives dealer, KnifeArt.com is pleased to offer this item backed by our full satisfaction guarantee, hassle-free return policy, and fast, free domestic shipping on orders over $150. Add the PUK to your tactical toolbox today!